I’ve been told I hold a pen in a very angry manner. Maybe that’s true, although I don’t see how it’s all that different than others. Sure, there are other ways to hold a pen, I even hold them differently for different tasks. When I’m signing my name on a delivery slip, for instance. Or when I’m signing my name and jotting down some numbers on forms at work. I hold a pen differently when I’m writing a check or slapping some facts down on a post-it. And I hold different pens in different ways. I don’t think that has much to do with my penmanship – I got that nasty trait from my Father, who I tend to take after in a lot of ways. And I’m from the generation who went all the way through school using pens and pencils. You could only turn in your homework typed if it was homework for typing class. 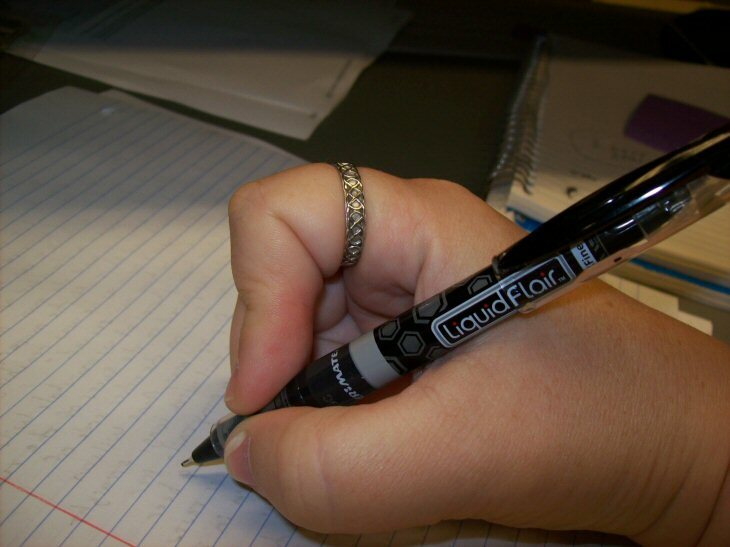 Anyway, this is how I hold my pen – and I harbor no hard feelings toward it whatsoever. 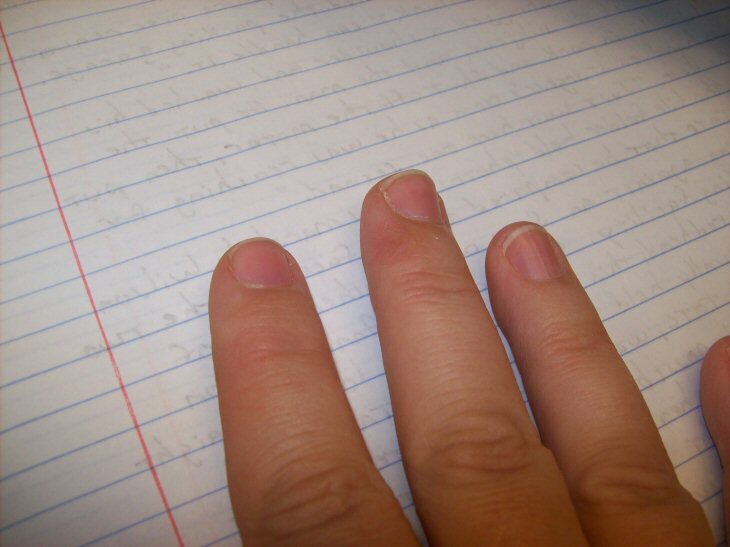 I’ve noticed as I handwrite my current novel, that my fingers last for about five solid pages before they’re so painful I have to stop for a rest. The first knuckle of my forefinger becomes red and tender (I’d been saying raw, and had Pete thinking I was bleeding all over the paper!) And that lovely, thick bump of a callous I’d had my entire school years has long since gone away, so I’m having to build that back up again, and it’s slow going. But that’s okay. This novel is all about going slow, taking the time required. It’s going to be a long, hot summer, and I couldn’t be more pleased. I’m going to be interested in seeing how my callous progresses, how long it takes to develop, how much stamina I’ll achieve and how strong my fingers will get over time. This is early on, I’ve just started Chapter 6 and I can manage, as I said, about five or six pages of handwriting a day before I really have to take a break and rest the fingers. I’m finding as I handwrite instead of computer write, I’m using different words, enjoying the language in a different way, and exploring scenes I would have glossed over or missed before. Not only that, but I can recall sentences from earlier verbatim, without having to go back to see what exactly it was I’d said. The novel has solidified in my mind in a more secure way than ever before.